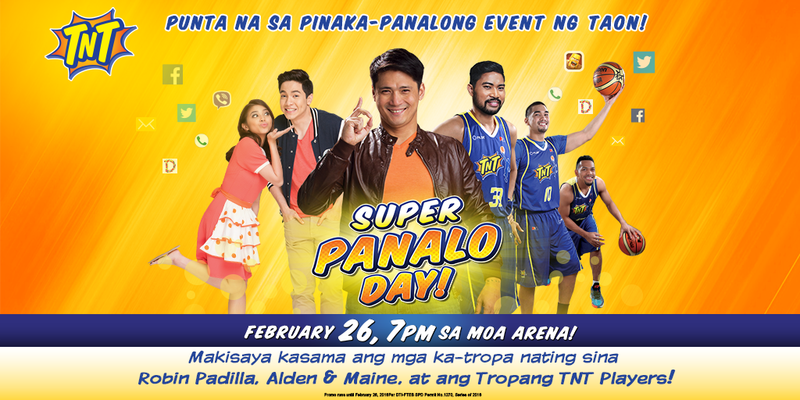 Alden Richards, Maine Mendoza, Robin Padilla and TNT Players for Talk N Text "Super Panalo Day!" Are you a fan of Alden Richards, Maine Mendoza, Robin Padilla or the Tropang TNT Players? Well I think it's about time for you to actually go out of the comforts of your living room and head to the MOA Arena this 26th because the BIGGEST party is about to happen. Yeap! This is Talk N Text's "Super Panalo Day!" and the party will start at 7PM. How to get tickets? That's the easy part. You can get tickets and load up at the Smart Tower located at 6799 Ayala Avenue in Makati City. You need to be there only from 10:00 am to 5:00 pm. This has began already since February 15, so if you're looking for VIP tickets, you should have been ready since then. You can also load up your existing TNT SIMs to get tickets at SM Mall of Asia and SM Megamall Information Booths on February 20 - 23, 2016 so you've still got time to do that now. As for VIP Tickets, you need to purchase the Panalo Phone Android worth P650, for the Patron you need to get at least the Php 500 TNT Load, while the Lower Box and Upper Box only costs Php 300 and Php 100 TNT Load respectively. Let's go there AlDub Nation! TNT Nation and Binoe Fans!